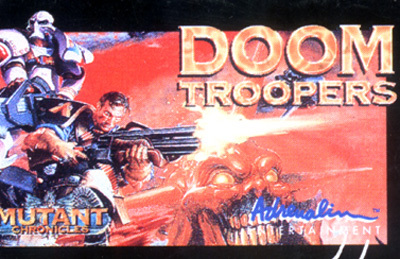 Doom Troopers is a platform shooter similar to the Contra series that is based on the Doomtrooper collectible card game, part of the Mutant Chronicles franchise. The player assumes the role of one of two commandos fighting an evil horde of invading zombies and mutants. The game features eight different levels and the ability of two players to play cooperatively. The game was known for depicting blood and mutilations of the enemies killed. For example, the common enemies in the first level are usually decapitated before they die.